First ELL Language Acquisition Summit! We are committed to helping your students succeed academically and become bilingual, biliterate, and bicultural along the way! 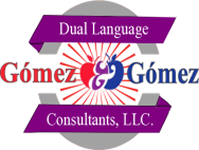 The Gomez and Gomez Dual Language Enrichment Model was first developed by Dr. Richard Gomez, Jr. and Dr. Leo Gomez in 1995 and has since been implemented in over 700 schools across the country! Explore our site for useful information about dual language programs and contact us to learn how your school and students can begin to reap the benefits of biliteracy!